If you’ve ever tasted ripe tomatoes fresh from the vine, still warm from the sun and sweet enough to eat out of hand, you will understand why my husband keeps trying to grow them—not an easy thing to do where we live. This year, he found a variety bred specifically for Oregon and Washington. He started the seeds inside on a heated pad to give them a head start and then potted them up and put them out on our back deck, the only place that gets full-day sun. We put water-filled, red plastic surrounds over the seedlings so we could put them outside while the nights were still cool. The water was supposed to absorb the sun during the day and keep the plants warm overnight to fool them into thinking they were in Texas or Florida. It probably helped, but unfortunately, we had the coldest Spring on record; it was May 14 before the temperature reached 70 degrees. Our plants survived but didn’t grow much until July and didn’t bloom until late in August. 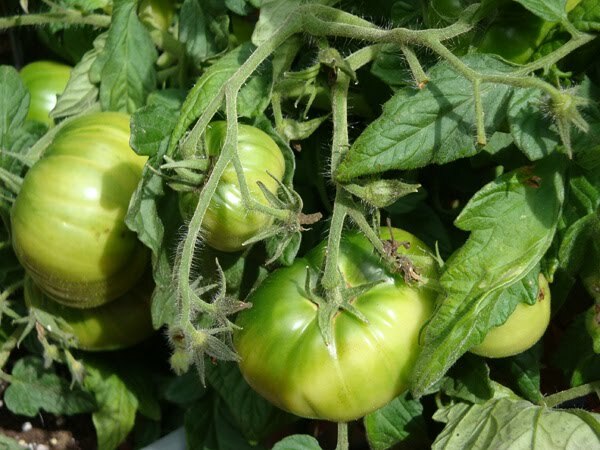 Finally, now in mid September, we have green tomatoes, but we are already back into Fall mode with highs in the 60’s and our prospects for ripe, home-grown tomatoes are fading fast. However, there is an upside to this story. An article by Lynne Rossetto Kasper about green tomatoes made a timely appearance in her column, “Ask the Splendid Table.” (The Seattle Times, Sept. 15, 2010.) She says, “anything you can do with a tart apple, you can do with a green tomato.” Bing! The light bulb came on. I know you can make desserts with tomatoes, but it hadn’t occurred to me that when they are still crunchy and tart they could sub for apples in condiments, chutneys, jams, and pies. I quickly looked up the nutrition data for green tomatoes. Although they are a little higher than ripe tomatoes, they are a LOT lower than apples. Below is my version of Lynne’s recipe for Rustic Italian Green-Tomato Jam. Check back after I’ve had time to experiment a bit more. This is going to be fun. Note: 100 grams of raw, green tomatoes has 5.1 grams of carbs and 1.1 of fiber for a net of 4 grams. (More than a red tomato by 1.28 net grams.) The same weight of apples has 13.81 grams of carbs and 2.4 of fiber for a net of 11.41 grams, so the green tomato has a significant advantage as a replacement for apples. I used a granular sweetener called Just Like Sugar, which is made of oligofructose and orange peel. I’ll try it with other sweeteners to see if they work as well. In a heavy sauce pan, mix the tomatoes, any reserved juice and seeds, and the sweetener. Let stand for 24 hours to draw out the juices. Grate the thin, yellow part of the rind from the lemon into the pan and add the lemon juice. Bring mixture to a boil over high heat. Reduce heat to a simmer and cook uncovered for about 40 minutes or until thick. Use like jam, as a topping for yogurt or ice cream, or spread in a low-carb, almond tart crust. (I’m going to try it in a turnover recipe I’ve been working on.) Refrigerate or freeze. Recipe makes 1 cup of jam or 16 servings of 1 tablespoon each. Total carbs–9.2 grams; Fiber 2 grams; Net: 7.2 grams. Tip: Additional advice from Lynne: Use green tomatoes raw or cook them down. If they are cooked for a short time, they will be slimy. Green Tomatoes, Lynn Rossetto Kasper, NPR. Bookmark. This is a great blog! I totally agree that sugar is the new fat. They're both quite bad in excess for us. Your ideas should help a lot of people with their own weight loss. Thanks Trevor! Good luck with your 100 pound weight loss goal.